Introducing Kaito, the RFP response automation platform. Try Kaito now! It was supposed to be another boring Wednesday meeting at the online company I worked for. The boss kept telling us about doing that and the other. A tired colleague, surfing the web, said: “I think a plane was hijacked.” It was the AeroMéxico Flight 576 flight from Cancún to Mexico City, a Boeing 737-752 carrying 101 passengers and 3 crew members. Soon, a colleague from sales started to discuss the plane’s engines, while a designer popped out of nowhere the wing aspect ratio and said how this plane’s particular landing gear was created. Everyone on board was eventually OK and I’ve learnt a new lesson: your colleagues are endless knowledge resources. I’ve never thought that an online company could house so many aviation aficionados. Sometimes, I learn things from unexpected people and unanticipated sources. And it goes both ways. I could tell you by heart the ingredients found in laundry detergent, like sodium lauryl sulfate and methylisothiazolinone, since I’ve made a habit out of reading product labels. Also, ask me anything about diecast model cars and I could tell you how good they are and whether the price is right. I’d say that we’re a bit more than the sum of the things we learn. To me, knowledge is a lot about collaborating with colleagues and experts. When our quirks are added into equations, here comes innovation, the creative endeavor everyone thrives for. There are tons of numbers and ideas people around you have and would love to share. You only have to ask them. Teams that use some sort of Enterprise Q&A can get up to a fifth of their answers from unexpected sources. “By bridging fresh thinking and existing expertise, teams can often interrogate biases in ways that accelerate innovation,” according to Essentials For Creating A Social Business Culture report. 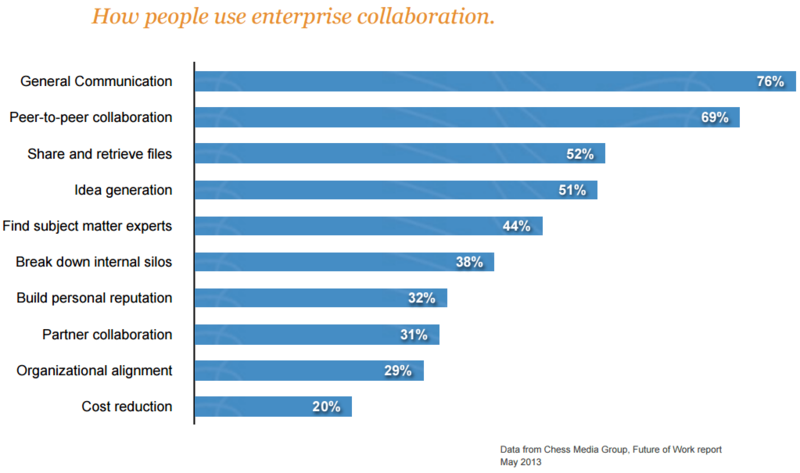 Social and enterprise collaboration is only going to increase in the following years. IDC forecasts that this market will reach $4.5 billion by 2016, compared to just $800 million spent in 2011. Big companies know this. Leading Through Connections, IBM’s CEO study, “ranked collaboration as the number-one factor that CEOs are seeking in handling the war for talent”. Graphic source: Essentials For Creating A Social Business Culture report by CoventureConsulting. Studies show that two thirds of the employees use enterprise collaboration tools to peer-to-peer collaboration, while half of them find them suitable when it comes to generating ideas. The approach is also cost effective, but that’s a good enough reason for just 20 percent of those participant in the Future of Work 2013 study by Chess Media Group, suggesting that most of the benefits translate into creativity and faster problem solving. When looking for answers and ideas, you might be surprised how safe and fast getting solutions from your peers is. A Q&A software could be just what your company needs to boost collaboration and competence. Looking for a great way to ask questions and build knowledge with your co-workers? Quandora enables simple, efficient knowledge sharing with your team, way more fun than a mailing list or a forum. For organizations that need to share their knowledge safely and privately. For organizations that want to automate their RFP response process.